Vega’s Recipe Centre has been one of my go-to sites for plant-based recipes for a while now. They’ve got entrees, snacks, desserts, smoothies, you name. It’s their blog where I discovered my favourite recipe for Cauliflower Buffalo Wings, Monkey Bread and soooo many smoothie concoctions. 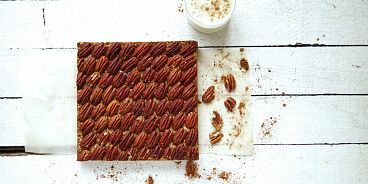 While scrolling Instagram on the weekend, I stopped at the site of these beautiful Pecan Pie Granola Bars (plant-based, as always). How pretty are the pecans?! I had to make them. Fortunately, Darren was home to watch our three-week-old baby Roen — otherwise, it’s pretty tough to get through a whole recipe these days! However, these bars are very straightforward (as are most of the recipes I choose) and doesn’t require a food processor or Vitamix (so not too many dishes to do afterwards). These fall treats are pretty sweet (containing maple syrup and coconut sugar), so could easily pass as dessert (for Thanksgiving?) or an indulgent afternoon treat. 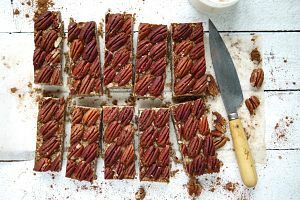 Here’s the recipe for Pecan Pie Granola Bars – enjoy!